3. Offers can be availed until March 14, 2019 only except on specified blackout dates. 4. Blackout dates apply to Christmas Eve (December 24), Christmas Day (December 25) New Year’s Eve (December 31), New Year’s Day (January 1), Chinese New Year (February 5), and Valentine’s Day (February 14). 5. Prior reservation is required and subject to availability. Book your reservations through HiltonManila_Reservations@hilton.com or call +63 2 239 7788. 6. Dining offers are exclusive for Dine-in transactions only. 7. One (1) qualified card may be used per single-receipt transaction, or per table; and only One (1) qualified card will be accepted per members per visit. Strictly no splitting of transactions. 8. Offer is non-transferable and non-convertible to cash or gift certificate (GC). 9. Purchases of goods and services which are on promotional discount, the senior citizen and persons with disabilities can avail of the promotional discount or the discount under the Expanded Senior Citizens Act of 2010 or Magna Carta for Disabled Persons, whichever is higher. 10. 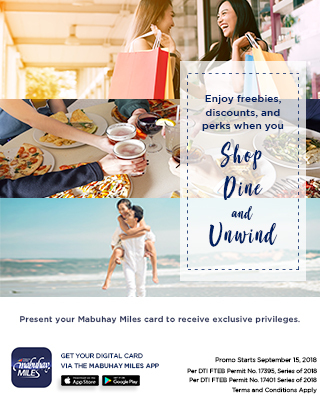 Offers may not be exchanged for other items or discounts and cannot be availed with other ongoing promotions and offers of Hilton Manila.